The case of Anna O., reported by Josef Breuer and Sigmund Freud in their1895 book Studies on Hysteria, provides the initial evidence for the effectiveness of psychoanalytic treatment. The patient’s actual name was Bertha Pappenheim (Gay, 1988; Jones, 1953). For the case study, her initials were shifted one letter earlier in the alphabet, and she was given the pseudonym Anna. Since the publication of her story, so many people have given their opinion of what was wrong with her that truth is difficult to determine in the welter of interpretation (recent review by Skues, 2006). At the end of the case history, Breuer and Freud speculated about the mechanisms of hysterical symptoms and their treatment. The patient showed evidence of a secondary state of mind with “its wealth of imaginative products and hallucinations, its large gaps of memory and the lack of inhibitions and control in its associations” (p. 45) This “unconscious” state intruded into her normal state of mind to cause her hysterical symptoms. Breuer and his patient interacted intensely over many, many hours. It is difficult not to speculate that the relationship between Anna and Josef went deeper than that between physician and patient. Breuer’s involvement with Anna plays an essential role in Yalom’s novel When Nietzsche Wept. Breuer’s wife became jealous of his fascination with the young woman, and Breuer stopped the treatment. The end of their relationship was terrifying. Anna appears to have undergone an hysterical pregnancy and miscarriage. Later psychoanalytic thought would consider such phenomena in terms of transference and counter-transference. The case of Anna O marks the beginning of psychotherapy. Reliving the emotions of a past trauma released them. After this catharsis, the repressed emotions no longer needed to manifest themselves in somatic symptoms. However, Bertha continued to experience various symptoms and her treatment was continued in a Swiss sanatorium (to which she had been referred by Breuer after he ceased to be her physician). Later psychoanalytic thought would suggest that the psychotherapy had not worked because it had not discovered the real repressed emotions – inhibited sexual desires for her father rather than grief at his illness. Furthermore, the goal of psychotherapy evolved not just to release the anxieties that well up from the unconscious but to make the conscious mind understand and control these forces. The unconscious must become integrated into consciousness rather than simply liberated. The case of Anna O. continues to be extensively interpreted. Some have suggested that she may have actually had a neurological rather than psychiatric disorder: tuberculous meningitis (extremely unlikely), epilepsy with complex partial seizures, or postinfectious encephalomyelitis (the various diagnoses are reviewed by Webster, 1996). Conversion hysteria may occur in conjunction with neurological disorders (Kanaan, 2009), but this is perhaps not as frequent as once was thought (Stone et al., 2005). Others have suggested that Anna’s conversion symptoms were part of a depressive illness (Merskey, 1992). Many other factors were not fully evaluated in the original case history. Anna had been taking chloral hydrate to help her to sleep in the afternoons so that she could stay up at night to watch over her father. In addition, her facial pains had been treated with morphine. Drug dependence may have played a role in her symptoms and in her hypnotic states. Perhaps Anna’s absences were caused by psychomotor seizures (temporal lobe epilepsy) precipitated (and exacerbated) by drug withdrawal and sleep deprivation (Orr-Andrawes, 1987). Anna O. ultimately led a very productive life (Kimball, 2000; Loentz, 2007). In 1888, Bertha Pappenheim and her mother moved from Vienna to Frankfurt, where Bertha became active in social work, running an orphanage and presiding over the Jüdische Frauenbund (League of Jewish Women). She was skeptical about psychoanalysis and opposed its use in the children under her care. Pappenheim wrote extensively on social issues and women’s rights. Her most important book dealt with the need to protect women from prostitution and white slavery (Sisyphus-Work). Under the pseudonym Paul Berthold, Bertha Pappenheim wrote stories and a play Frauenrecht (Women’s Rights, 1899). The play has intriguing parallels to Bertha’s real or fantasized relations with Breuer. The protagonist, who has recently joined the Women’s Relief Society, asks her husband for some of the money that she brought to their marriage to support a sick young female worker and her illegitimate child. The husband refuses on principle. However, he does not realize that he is the father of the child. Bertha Pappenheim suffered in her youth from a conversion disorder. Her symptoms were triggered by her grief at her father’s illness and her mourning for his death. The suggestion that her disorder was neurological rather than psychological is unlikely given its outcome. She became well. However, she was not cured by her physicians. Whatever psychotherapy occurred during her interaction with Josef Breuer, she had herself invented. Most impressive, however, was what came afterwards (Kimball, 2000). 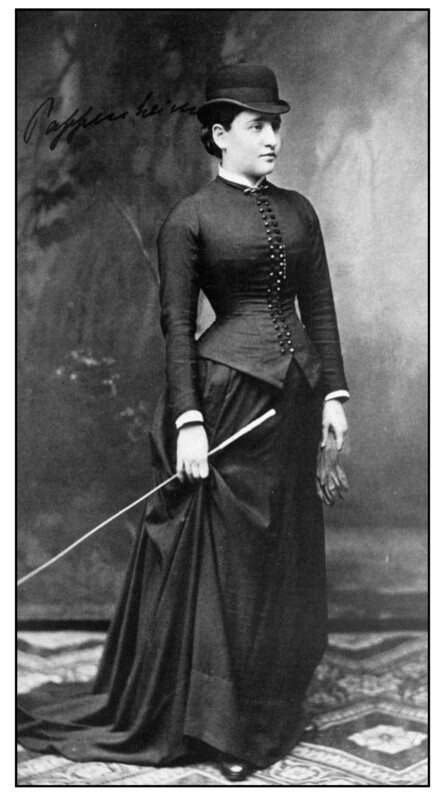 The photograph at the beginning of this article, taken in 1882 after her treatment with Breuer was over, shows an elegant and confident young woman in riding outfit. However, she still had a long way to go. Somehow, over the next five years, she was able to pull herself together, to stop taking the drugs she had been prescribed, and to find an outlet for her intelligence and will in social work. Jones, E. (1953). Sigmund Freud: life and work. London: Hogarth Press. Kanaan, R., Armstrong, D., Barnes, P., & Wessely, S. (2009). In the psychiatrist’s chair: how neurologists understand conversion disorder. Brain, 132, 2889-96. Kimball, M. M. (2000). From “Anna O.” to Bertha Pappenheim: transforming private pain into public action. History of Psychology, 3, 20-43. Loentz, E. (2007). Let me continue to speak the truth: Bertha Pappenheim as author and activist. Cincinnati: Hebrew Union College Press. Available through Google Books. Merskey, H. (1992). Anna O. had a severe depressive illness. British Journal of Psychiatry, 161, 185-194. Orr-Andrawes, A. (1987). The case of Anna O.: a neuropsychiatric perspective. Journal of the American Psychoanalytic Association, 35, 387-419. Skues, R. A. (2006). Sigmund Freud and the history of Anna O: Reopening a closed case. Basingstoke, Hampshire: Palgrave Macmillan. Webster, R. (1996). Why Freud was wrong: Sin, science and psychoanalysis. London: HarperCollins. (Chapter 4: Anna O. and the birth of psychoanalysis, pp 103-135). Yalom, I. D. (1993). When Nietzsche wept. New York: HarperPerennial. Hey so this is a great article with loads of useful details about this interesting case, the index case of psychoanalysis. Now, I read that Freud and his biographer basically spread some lies about how it all ended, which were taken as truth until others uncovered documents proving things literally could not have happened in the way they portrayed, which seems now to have been accepted? But how, as a scientific medical man, can you write this without comment or caveat? A young lady nursing her sick father, seeks help, and ends up being portrayed (with no evidence (and not be the actual treating physician) as having had sexual desires for her father? That’s actually abusive medical practice, especially since they’d published her story while only superficially covering up her identity. Many thanks for the comments. Your caveats are reasonable. (i) The story of Bertha Pappenheim’s fantasy of pregnancy and birth is indeed not well documented. It comes from Freud, through his biographer Ernest Jones (1953, pp. 223-226) and a letter from Freud to Stefan Zweig (quoted by Gay, 1988, p. 67). There is some dispute about related details (when Breuer stopped treatment and when his daughter was born) but not about the story of Anna O’s fantasy (see Gay’s note p. 664). Meredith Kimball (2000, pp 25-28) presents probably the best evaluation I have read concerning whether the story represents what actually happened or not. The lack of other evidence raises the possibility of fiction, but the story’s very vividness suggests reality rather than myth. Kimball interprets the fantasy in terms of Bertha finally becoming free of her prolonged dependence on Josef Breuer. I do not think that Freud spread lies about Anna O; rather he tried to interpret what had caused her very complicated symptoms. The fact that Anna O was actually Bertha Pappenheim was not public knowledge until revealed by Jones in 1953, long after she had died in 1936. For me the most striking aspect of the story of Anna O is Bertha Pappenheim’s indomitability. She survived a very difficult time and went on to a life of achievement and creativity. The idea of psychotherapy as a “talking cure” comes from her. Thank you very much for responding and for the excellent Kimball PDF link. I have to say I don’t find her ‘lines of evidence’ for believing the Freud-Jones story to be evidence really – such as that it was told vividly and specifically, or that it may seem consistent with the theoretical psychodynamics of the case or with Breuer ending it as an ordeal. I wonder does this somewhat more recent 2004 article change your view at all by stating: “Borch-Jacobsen finally and unequivocally scotches the Freud-inspired campaign of denigration. There was no pseudocyesis and Breuer did not flee to Venice for a second honeymoon.” Apparently Freud also claimed Breuer’s wife had attempted suicide due to jealousy but that has apparently been refuted by other documentary evidence. I very much agree about the striking nature of Pappenheim’s dedication and creativity. The 2004 paper by Kaplan to which you link provides a good review of the many different theories concerning the illness of Anna O, and comes down on the side of Mikkel Borch-Jacobsen’s 1996 book Remembering Anna O: a century of mystification. Borch-Jacobsen was right to dispute some of the details of Freud’s memory: Breuer’s leaving to take his wife on a second honeymoon and the date of the birth of his daughter Dora. However, he really brought no evidence to bear on Freud’s report of the pseudocyesis and fantasy labor other than that Freud had also told the story to others in his immediate circle (as well as Ernest Jones and Stefan Zweig), and that some had doubted its veracity. Borch-Jakobsen proposed that Freud either deliberately or subconsciously constructed a false memory of what had happened in order to explain Bertha Pappenheim’s failure to get better and to justify his new theory of repressed sexuality. However, this is as much a conjecture as Freud’s purported false memory. Much of Birch-Jacobsen’s work has been directed to proving that Freud attempted to re-write history to justify his theories and to consolidate his power as a leader to the psychoanalytic movement. His most recent book (with Shamdasani, 2012) is The Freud Files. He was also a major contributor Le Livre Noir de la Psychanalyse (Meyer, 2005), the handbook of the Freud wars in France. I have mentioned some of this controversy in my post on Freudian Legacies. Whether or not Bertha Pappenheim actually had a fantasy of pregnancy and labor is not known. To my mind it fits with the theatrical nature of her other symptoms. I do not think that Freud was an evil charlatan nor do I consider him a sainted genius. He considered things that had not been thought about before, had many interesting ideas, and made some major mistakes. Pace Borch-Jacobsen, I think that Peter Gay’s biography provides an unbiased critical review of a life that certainly changed the way we think about ourselves. Borch-Jacobsen, M. (translated by K. Olson, 1996). Remembering Anna O: a century of mystification. New York: Routledge. Borch-Jacobsen, M., & Shamdasani, S. (2012). The Freud files: an inquiry into the history of psychoanalysis. Cambridge, UK: Cambridge University Press. Meyer, C. (Ed.) (2005). Le livre noir de la psychanalyse, Paris: Les Arènes. I enjoyed your book Guises of Desire. I found it helpful to have a novelist’s interpretation of Bertha Pappenheim’s experience during the course of her treatment by Josef Breuer. Your blog considers many of the unsolved issues about Pappenheim’s illness, as well as the more general issues surrounding historical novels. I particularly enjoyed your point that the historical evidence in this particular case – the case histories of Breuer and Freud – is most certainly as much interpretation as fact. I think John Irving once proposed that Freud should be considered as a novelist rather than as a scientist. Your book presents a vivid and seemingly accurate interpretation of Pappenheim’s life in Vienna at the time of her father’s final illness and Breuer’s treatment of her hysterical symptoms, and ends when Breuer ceases to be Pappenheim’s physician. The epilogue describes Pappenheim’s later career as an author and social worker. What is fascinating to me is what happened in between. Here there is no evidence for even a novelist to interpret. During this time, Pappenheim was somehow cured of her addiction to morphine and relieved of her multiple symptoms. My intuition is that these changes were largely her own doing. My thinking stems from her later character – she could do many things if she put her mind to it – and the general inability of physicians at that time to cope with psychological problems. I think she cured herself.